We are delighted to present the details for 35 Dart Marina ideal for a cottage holiday in Dartmouth, Devon. To book or find out more please use the Booking Info or Availability buttons below. Our Dart Marina properties are situated on the edge of the River Dart in Dartmouth, one of the West Country's most sought after locations. Designed by award-winning architects, featuring many high-tech 'extras' and stylishy finished, a short break or longer stay at Dart Marina offers the ultimate in luxury self catering all year round. .The Dart Marina properties boast stunning water views and many have free use of the luxury Dart Marina Health Spa included. The elegant River Restaurant and first class yacht harbour are all close by, so you can enjoy the boutique hotel experience with the flexibility and freedom of a large, stylish holiday apartment. When you book a holiday at 35 Dart Marina you also get access to an indoor pool. An indoor pool is perfect for a swim what ever weather Devon decides to produce on your holiday. Imagine being able to start your day of touring Devon with a refreshing swim in an indoor pool - bliss! There is wifi or internet access available at 35 Dart Marina in Dartmouth. Perfect for searching for things to do whilst on holiday, catching up on emails or even work if you have to. On nice days, when you want to relax you can sit out in 35 Dart Marina's garden and enjoy the sun shine. Children also love the outdoors so it can be a great place for them. Although, with young children you should always check any garden is safe for them. There is one or more televisions at 35 Dart Marina. Ideal if you want to catch up with the latest on your favourite programmes or just fancy a quiet night in relaxing in front of the box. Why waste part of your holiday doing the washing up. 35 Dart Marina has a dishwasher installed to save you time, and family arguements, about the washing up. Everybody hates doing the washing up and the last thing you need is a big family arguement about who is going to do the washing up while you are on holiday. Great news if you just want to get away for a long weekend or short break. 35 Dart Marina accepts bookings for short breaks. So if you fancy a few days in Devon to recharge your batteries then this cottage is well worth consideration. 35 Dart Marina sleeps up to 6 people so could be perfect for your family or group. So if you are looking for a family holiday in Devon then 35 Dart Marina could be just the ticket. APARTMENT 35, DART MARINA (2ND FLOOR)ENTRANCE - Two flights of stairs or a good sized lift lead up to the apartment entrance which opens into a spacious hallway. Separate utility cupboard with washer/dryer. LOUNGE/DINING ROOM - A stylishly elegant lounge with two triple 'Quba' sofas, large 'Quba' bean bag, contemporary gas fire (for decorative purposes only), widescreen television with Sky including Sky Sports and DVD/video player. An integrated CD/radio music system (also iPod compatible) is available in most rooms. Round glass dining table and six clear chairs. Sliding glass windows can be folded back to create a wonderful internal balcony with lovely views up and down the river and across to Kingswear. KITCHEN - Stunning, state-of-the art kitchen, with Poggenphol units, integrated Smeg appliances including magnificent 5-ring gas range and oven, dishwasher, fridge/freezer, microwave, and stone worktops. BEDROOMS - The master suite has a King Size bed, bedside units, built-in wardrobes, dressing table, TV with integrated DVD player. Beautiful, fully-tiled En suite with shower, wash-hand basin, heated towel rail and Shaver point. The second bedroom has a double bed, bedside units, built-in wardrobes, dressing table, TV with integrated DVD player. The third bedroom has two single beds*, bedside units, built-in wardrobes, dressing table and TV with integrated DVD player (* N. B. These single beds can be linked together to create a 6' super-king size bed. Please confirm requirements at time of booking). 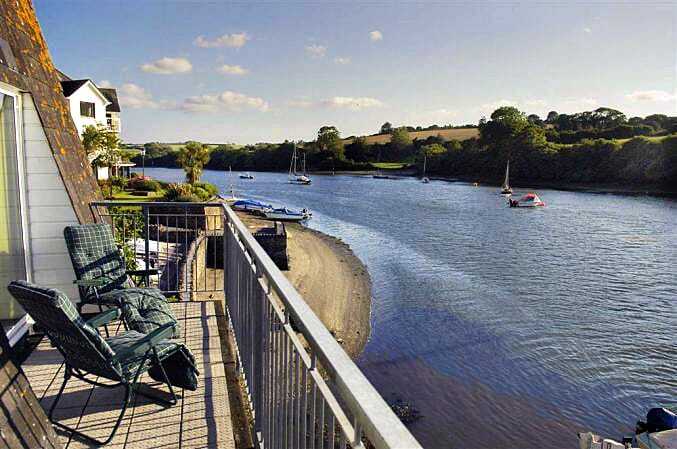 Due to this apartment's unique position at the end of the development it has lovely views from all three bedrooms up the river towards Noss and Dittisham. BATHROOMS - In addition to the En suite (above) is a lovely family bathroom with Kaldewei bath, shower (over), wash-hand basin, heated towel rail and shaver point. Bathrooms are beautifully presented with fluffy towels and complimentary toiletries. PARKING - Apartment 35 has two allocated parking spaces. WIFI - wireless broadband internet is available. DART MARINA SPA MEMBERSHIP - Guests can enjoy the use of the luxury facilities of the Dart Marina Health Spa, including indoor pool, steam room, Jacuzzi, gym and beautifully designed relaxation areas. Beauty treatments from Elemis can be pre-booked, with 10% off for those staying in our Dart Marina properties. As you can see Dart Marina is located in a great location. The perfect base for any holiday around Dartmouth. And well suited to explore the whole of Devon. There are plenty of great places to vist near 35 Dart Marina. Take a look at out holiday ideas pages for details of many places that are well worth considering visiting whilst on holiday at 35 Dart Marina. Enjoy views over the countryside with touring, walking, cycling and riding on quiet country lanes and a number of beaches close by.